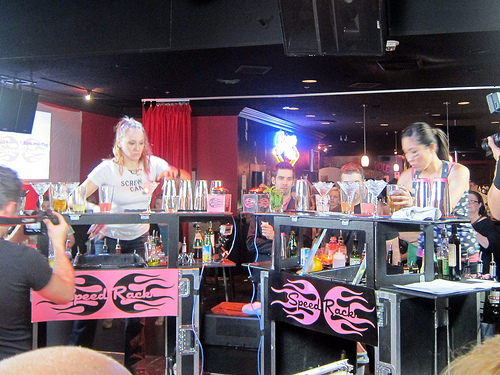 Speed Rack has wrapped up its 10-city tour with a stop in Las Vegas. 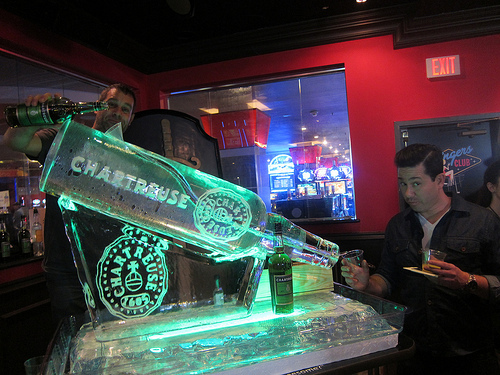 The competition took place at the Swingers Club at the Plaza Hotel in Downtown Vegas. The winner is Hsiu-Ting Yu from Fusion Bar at the Palazzo. She beat out 7 other ladies including a few who traveled from out of state. She joins Yael Vengroff (NYC), Sabrina Kershaw (Boston), Melissa Cross (Seattle — from the Portland, OR competition), Kylee Van Dillen (LA), Karin Stanley (Washington DC), Jill Webster (SF), Alba Huerta (Houston), Amanda Olig (Denver) and Jennifer Contraveos (Chicago) on May 10 in New York for the finals. Currently, you can vote for 6 Wild Cards to join the finals here. You can vote once a day. 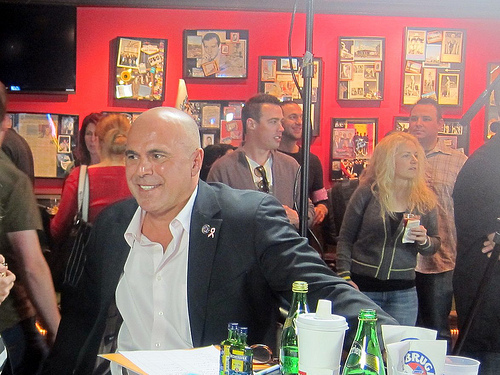 The four judges were Charlotte Voisey, Chef Kathy Casey, Tony Abou-Ganim and Audrey Saunders with Chris Patino as the MC. Having attending two other competitions, I knew the drill. There was an elimination round that culled the group down to 8. The competitors had to make four cocktails, one for each judge. You could be very fast but judges can add time to your score if they didn’t like the drinks for whatever reason. I saw one completely miss the mark on an old fashioned- using rum instead of whiskey. The recipe cards are right in front of you and you have given time to study but the name of the game is speed and sometimes you hope your good time will help. It’s interesting to note most did not use jiggers but those who did would lose time for that move. Also, in the immortal word of Audrey Saunders “if the drink calls for bitters, USE bitters.” Some just didn’t use enough. The admission price included food and drinks. I saw the Chartreuse luge and knew immediately that this would be my favorite stop. What a beautiful sculpture. 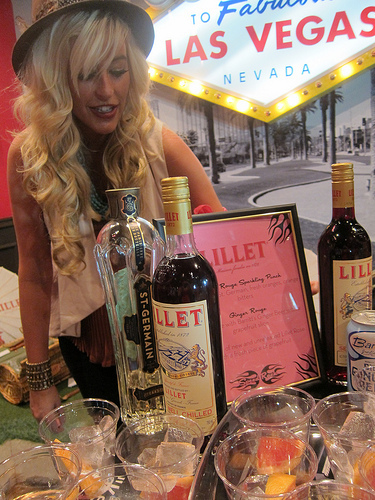 I also did tastings with Four Roses Bourbon, had drinks from Macchu Pisco, Lillet (prettiest booth!) 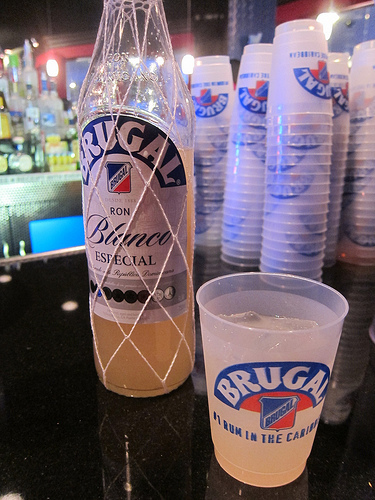 and Brugal Rum. 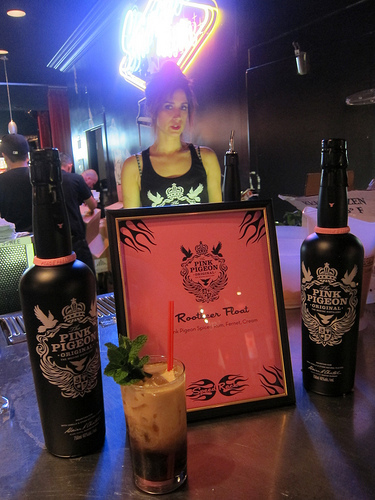 But my favorite drink was the Rootbeer Float with Pink Pigeon rum, Fernet, cream and root beer. The mint garnish was just perfect. I’m looking forward to the finals in New York. Keep an eye on Speed Rack’s Facebook and Twitter pages for more information. This entry was posted in alcohol education, alcohol tasting, bar stories, bars, bartenders, cocktail competition, cocktail week, cocktails, contest, events, hot bartenders, spirits, the minty, travel and tagged alcohol education, booze tasting, cocktail week, competition, contest, event, finals, hot bartenders, las vegas, manhattan cocktail classic, mcc, new york, plaza hote, speed rack, speed rack finals, speed rack las vegas, swingers club, the minty, travel, vegas. Bookmark the permalink.